In Paris yesterday, Russia’s Vladimir Putin disputed a remark by France’s François Hollande that any solution to the Syrian crisis requires Bashar al-Assad to step down or be removed. A few hours later in Geneva, Putin’s representative voted against a resolution by the UN Human Rights Council calling for a special inquiry into the May 25 Houla massacre that left 108 people, including 49 children and 34 women, dead. The resolution was approved by 41 votes in favor, three against (Russia, China and Cuba), and two abstaining (Uganda and Ecuador). In the resolution, Council members deplored the “outrageous killings” in Houla and emphasized the continued failure of the Syrian authorities to protect and promote the rights of all Syrians. In addition, the Council asked the Commission of Inquiry to publicly identify, if possible, those responsible for the atrocities and to submit a report on the results of its investigation at its next session, which will be held from June 18 to July 6. It also requested that joint special envoy Kofi Annan brief the Council at the said upcoming session. The Commission of Inquiry was established at the Council’s second Special Session and it presented its first report on 28 November last year, concluding that the substantial body of evidence it had gathered indicated that gross violations of human rights had been committed by Syrian military and security forces since the beginning of the Syrian uprising in March 2011. In its update to the Council in May, the Commission of Inquiry said the Syrian Government has so far not provided it with access to the country. In addition, it said the Syrian army and security services committed most of the serious violations as part of military or search operations in locations thought to host defectors or armed people, and those seen as rebel supporters. Before Friday’s vote, the top UN Human Rights official, Navi Pillay, urged the UN Security Council to consider referring the case of Syria to the International Criminal Court (ICC). 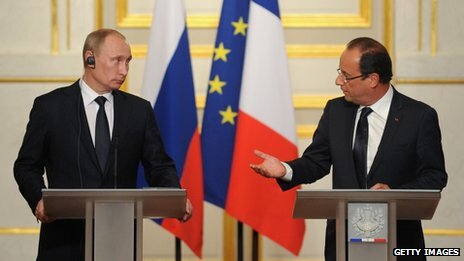 In Paris meanwhile, Putin and Hollande clashed over Assad’s ouster. “Why do we think that if we push someone from the current leadership away from power, prosperity will arrive there tomorrow?” Putin retorted. “What is happening in Libya, in Iraq? We all know what kind of a tyrant [Muammar] Gaddafi was. Maybe. But do you know what was happening in Sirte when militants entered the city? Why do you not write about that? Has humanitarian wellbeing settled there?” Putin asked journalists. Putin said Russia, which supplies arms to Syria, “has no special military or economic ties” to the country and that Assad visited Paris (under Nicolas Sakozy) more than Moscow. "We are not for Assad, not for his opposition, we want to reach a situation where violence ends and a large-scale civil war is averted," he said. The Russian president said it was "counterproductive" to declare Annan’s peace mission a failure, but declined to say how long it should be given to work. The Russian foreign ministry Friday backed Damascus claims that the Houla massacre was the work of “terrorist gangs” intent on undermining Annan’s mission. However, Putin took a different line, appearing to concede that government forces had at least played a part in killing civilians, but saying the rebels were guilty of similar acts. "How many peaceful civilians were killed by the opposite side? Did you count? The count goes into the hundreds there too. Our goal is make peace between the sides of the conflict." Asked whether sanctions should be toughened against Syria, Putin said the UN Security Council should first of all address the issue. “I think you know sanctions don’t always work effectively,” he said. He said no one might resolve state structure or country administration issues for the Syrian state. “If you think you can decide that for other nations, go to Cairo now and take part in the Egyptian presidential elections. You can’t do that! Nor can you or anyone else do that in Syria,” Putin said. Rashed says, “I can draw a long list of comparable positions taken by Russia on major international problems, like Bosnia-Herzegovina, Kosovo, Libya and now Syria. Russia stood by the villain until the end in all these cases.” Moscow’s support is also what encouraged Iran to overreach itself in its nuclear program, causing a host of serious international and regional problems in the Gulf.